Is my time slot a guarantee? Can I use Save My Spot even if I do not have insurance? What about Medicare or Medicaid? Can I save one spot for multiple people? When I arrive, will I see a doctor right away? What if I save my spot, and then start feeling a lot worse? What happens if I'm late? I saved my spot in line, but now I cannot get there on time. Can I adjust my time? I don't need to go to the Urgent Care or Walk-In Clinic anymore. How do I withdraw my saved spot? I'm not sure if I should go to an Urgent Care or a Walk-In Clinic. Is my time slot a guarantee? No, it is not, but we will do our best to see you when you arrive. Can I use Save My Spot even if I do not have insurance? What about Medicare or Medicaid? Yes, anyone can save their spot in line for free. It does not matter what insurance you have or if you do not have any. Can I save one spot for multiple people? No. We can only see one patient per time slot. If more than one person needs to be seen, please save additional time slots. You can view additional times by clicking on the blue drop down bar. When you arrive, proceed to the front desk to let us know you're here. Walk-In Clinics: You will be seen by a member of the healthcare team as soon as possible after you check in. We will evaluate your condition and decide on the best course of action for you. You may be seen by a nurse, physician, physician assistant, or some other combination of healthcare professionals. Urgent Care: You will be seen by a member of the healthcare team as soon as possible after you check in. If a patient in more critical condition arrives after you, they will receive care first and this could affect your wait time. You will be cared for by a member of the healthcare team who will evaluate your condition and decide on the best course of action for you. You may be seen by a nurse, physician, physician assistant, or some other combination of healthcare professionals. What if I save my spot, and then start feeling a lot worse? If you are feeling worse, do NOT wait for your time slot. Go to the nearest Emergency Department immediately. If you feel that your condition is "life threatening," call 911 right away. There is a 15 minute grace period. If you arrive later than that time frame, you may lose your spot in line. I saved my spot in line, but now I cannot get there on time. Can I adjust my time? Simply go online and save your spot for a new time. The system will automatically cancel your old one. I don't need to go to the Urgent Care or Walk-In Clinic anymore. How do I withdraw my saved spot? Call the facility where you made your reservation, and tell them that you no longer wish to save your spot in line. I'm not sure if I should go to an Urgent Care or a Walk-In Clinic. 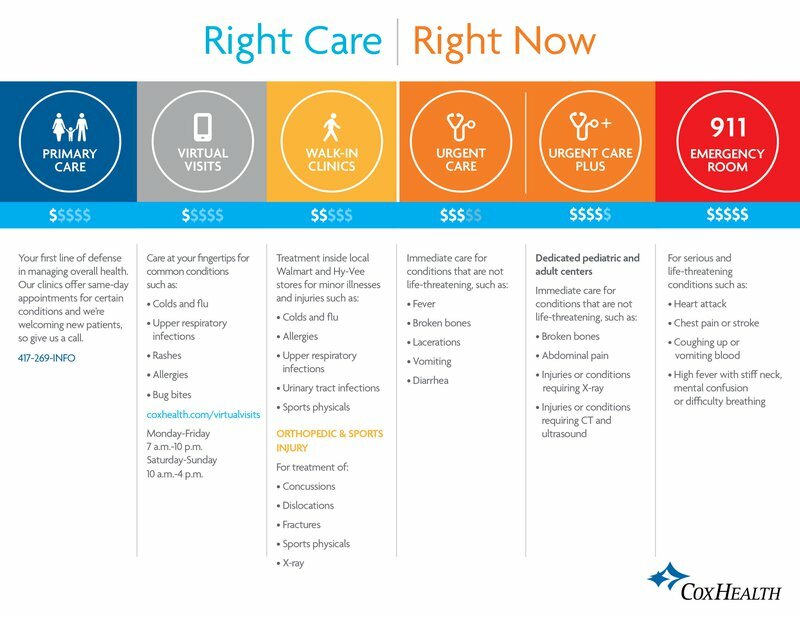 If you aren't sure what level of care you need, this chart may help you decide. You can also call us at 417-269-4636.